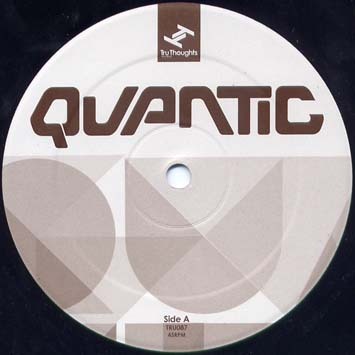 'Tell It Like You Mean It' is the first single to be taken from 'An Announcement To Answer', Quantic's fourth solo album and eighth in total for Tru Thoughts. His previous releases have won support from across the globe, each one marking a new chapter in the development of Quantic's sound. This latest 12" offers listeners an insight into the direction he is taking for the forthcoming album, while delivering the trademark funky grooves that have made Quantic a sure fire floor-filler for DJs worldwide. Deeper, fatter and just a little bit darker, the new album resonates with the kind of intricate production values we’ve come to expect from this ultra prolific 25-year-old artist. Due for release on 24th, July, it features collaborations with Ohmega Watts (Ubiquity) and Noelle (The Rebirth). "This is a musical tale of a group of Giraffes going for a stroll & getting lost in a forest. Luckily, their long necks meant that they were able to pop their heads above the tree canopy & find their way out again..."
That should help! 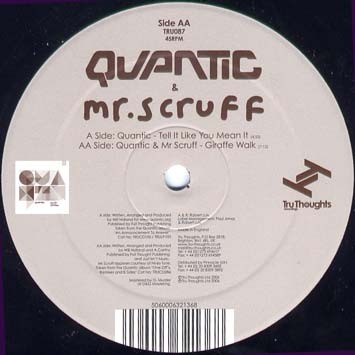 Giraffe Walk is taken from Quantic double CD album 'One Offs, Remixes and B-Sides' out now on Tru Thoughts.